This audiobook will show that the fundamentals, structure, formations, grammar, and syntax are exactly the same in music and in the Egyptian alphabetical language. The audiobook will show the musical/tonal/tonic Egyptian alphabets - being derived from the three primary tonal sounds/vowels; the fundamentals of generative phonology; and the nature of the four-sound variation of each letter and its exact equivalence in musical notes. It will also show the generative nature of both the musical triads and its equivalence in the Egyptian trilateral stem verbs; utilization of alphabets and the vocalic notations for both texts and musical instruments performance; and much more. This audiobook is divided into 10 chapters. Chapter one: "Historical Deception of the (Ancient) Egyptian Linguistics" will clear the intended confusion to hide the alphabetical form of writing in ancient Egypt - as being the source of all languages throughout the world. 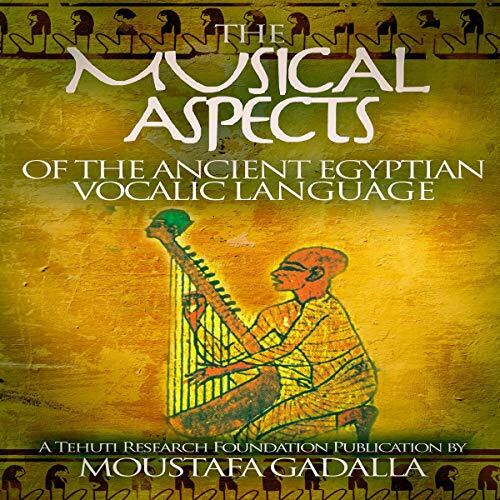 Chapter two: "The Seamless Language and/of Music" covers the unity of musical tones and Egyptian alphabet as well as the intimacy between language/speech/vocals and music in the Egyptian system. Chapter three: "The Human Vocal Instrument" covers the details of the human vocal-generating system and its equivalence in musical instruments. Chapter four: "The Three Primary Tonal Sounds" covers the three primary rhythmic tones and their equivalence in the Egyptian three quantal vowels/sounds. Chapter five: "The Musical/Tonal/Tonic Alphabet" covers the letters of the Egyptian alphabet being derived from the three primary tonal sounds/vowels as well as the utilization of alphabet for musical instrument tonal notations. Chapter six: "Duality of Letters/Musical Tones" shows the dual nature of alphabetical letters and musical tones. Chapter seven: "The 'Atom' of Musical/Vocal Sounds" covers the fundamentals of generative phonology and the nature of the four-sound variation of each letter and its exact equivalence in musical notes. Chapter eight: "The Musical Rhythmic Sound Segmentation" covers the orderly sound segmentation in musical flow and its equivalence in syllables stream - in all variations of length, duration, stress, junctures, boundaries, etc. Chapter nine: "Harmonic/Rhythmic Word Formation/Morphology [Musical Triad]" covers the generative nature of both the musical triads and its equivalence in the Egyptian trilateral stem verbs. Chapter 10: "Tonal/Musical Sentences & Their Types/Various Forms [Themes and their variations]" covers the exact similarity between musical structural forms and sentence structures in grammar, syntax, semantics, functions, and forms, etc.